Pest Control. Prevention is better than Cure! Select Home Services Ltd have a group of fully qualified (ERMA-EPA) professional technicians who are experienced in all types of pest control in both domestic and commercial areas. Any pest issue you have, big or small, Select Home Services can solve it and put things in place to prevent it from occurring again. Remember when talking pests… PREVENTION is better than cure! Flies, Cockroaches, Ants, Mosquito’s, Spiders, Silverfish, Flea’s, Carpet Beetle, Moths, Wasps, Bees, Borer, Rats and Mice… just to name a few! Cockroaches can grow from eggs to adults in 40 days under certain conditions and produce egg sacks containing between 30-40 eggs. Cockroaches attach their faeces to surfaces in and near where they live. These spots can look like pepper/coffee grinds and are one of the key signs that cockroaches are there or have been. Infestations have a characteristic musty smell mainly caused by the aggregation pheromones in the faeces. Moisture and electrical equipment are key factors where they are found. Fridges, cookers, ovens, microwaves and under preparation benches. 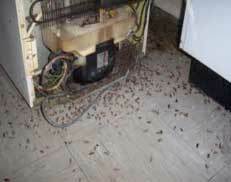 Because cockroaches commonly feed on decaying food scraps and frequent sewage systems and septic tanks, they are a huge threat to human health. German cockroaches produce filth, contaminate food, pollute water supplies and are vectors of diseases such as salmonella (food poisoning), gastro-enteritis and diarrhoea. They are always associated with parasites and are a source of allergens for people, particularly children. If food sources are locked up and homes are kept clean, cockroaches have been known to feed from inside children’s nappies and will bite the child if it stirs in the night. The resulting sores can become large and infected. This problem occurs in New Zealand and has been witnessed by our technicians in and throughout greater Auckland. We offer a wide range of services to the Commercial market from single visit clearout work to fully integrated programmes designed to suit each individual customer. Our customers range from Warehouse units in Industrial locations to Restaurants in the City and Cafes in suburbia so these pests can and do appear everywhere. We inspect a premises first to evaluate what control will be needed to treat what pest and then we can work out a programme not just to control the pest but what will be best to suit your budget. It is vital to identify the pest we are dealing with. Most programmes range from monthly to 6 weekly and even 3 monthly with the occasional request to treat annually. Commercially if you handle food products you should have a prevention programme in place, we know that the local environmental health authorities look upon this favourably. Inspect premises and set up using insect monitors. Apply gel baits to selected areas if infestation appears bad. Follow up 5-7 days later to check on initial progress (advice given on how to stop the spread -usually hygiene related). At this time we may place more traps and add more gel bait. Further visit after 1 month. During the inital visits we also have the option of wet spraying or dusting to clear a problem but we feel the monitoring and gel baiting system is the most successful. To be honest a well established infestation will not be cleared out in an hour or two, we work with more realistic expectations. Depending on the type of cockroach found there are a few different methods and treatment types used by Select Home Services to cure and cockroach problem you may have in your home, pyrethrum spraying/misting being the most common and successful way of treating the native species. Remember, prevention is better than a cure and Select Home Services have a treatment that will prevent you from having cockroaches in your home. Rodents can and do cause significant damage to both your home and business, they also can also damage your health. Methods of control consist of baiting and trapping, there are various “electrical” devices in the market place but we as a company do not use the ‘electrical” method as the tests we have used in the past were not successful. Select Home Services can cater to any pest controls needs you may have in the domestic sector. In Domestic areas there are a wide range of treatments, methods and products used to cure and/or prevent pest issues. The treatment type, method products used depend on what pest you want to prevent or cure, the type of environment your property is in and the size of the issue. New Zealand has a beautiful large green environment with residential areas being covered with lots of bush, trees, reserves and parks and nearby beaches and rivers. The one and only setback of such an environment is that is leaves our homes susceptible to being intruded by many common household insects and rodents. New Zealand is unique to all other countries in many ways and our love of north facing homes with large open living areas and large open windows is one. Unfortunately this invites lots of the common house fly, normally when friends and family are visiting for lunch or a barbeque! Flies are attracted to odours such as food cooking, rubbish, dogs and cats and their poop, barbeques and even fresh new paint. The common housefly spreads disease and bacteria when they land on our food, food preparation areas, glasses, plates, and cutlery and infants toys. This can lead to all kinds of sickness and ‘tummy bugs’. Fortunately this is easily solved and Select Home Services have the equipment and expertise to cure this common pest problem. During the time of one easy phone call you can book a time for Select Home Services to visit your property and treat all inside wall and ceiling surfaces and outside living areas (BBQ areas etc) with a natural pyrethrim which will actively repel and kill flies if they enter your home and all for a very affordable competitive price. All these products have a repellence life of approximately 6-8 weeks but will continue to kill the flies after that time when they enter the property and land. We have found that a “top up” treatment is beneficial to those customers looking for a 3-4 month period. This treatment consists of a maintenance in the kitchen and dining area. Treating in November for Flies will not last all summer without the top up treatment after 6-8 weeks. Select Home Services can also provide you with pyrethrim dispenser machines that release a small amount of spray to help repel insects. 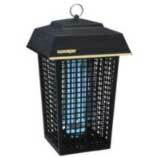 This coupled with a full house treatment is very successful at ridding your home from flies and other flying insects. Store waste bins, bags in the shade and away from the house. Stand dog baskets, kennels in the shade and away from the house. Store cat and dog foods outside and in the shade. Move barbeque away from house after cooking. Clear up dog poop regularly. Stand compost bins in the shade and away from the house. By implementing the above things in and around your home you will reduce the odour’s which attract flies and therefore reduce the number of flies in and around your home. 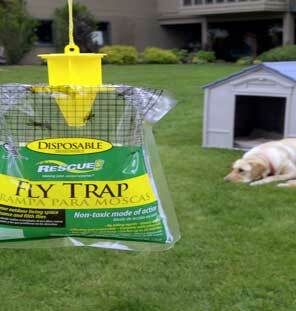 Rescue Fly bags available for use during the summer months, excellent for keeping the flies away. They do smell more the older they get but simply keep topping up the water and move them gradually further away and the flies will move with them. There are many types of spider in New Zealand. Spiders feed on insects and like dark cooler areas in and around your home. You will often find them and their webs on the darker side of you house, up inside window frames, cupboards, car ports, under eaves and decking and in corners of darker rooms in your house. Select Home Services can easily prevent or cure spider issues in your home by covering inside walls with a natural pyrethrum and treating around doors and windows, along the base of all walls and up under eaves outside your home. New Zealand also has a large population of white tails. White-tailed spiders hunt for their prey instead of spinning a web to catch it, and their preferred prey is other spiders. 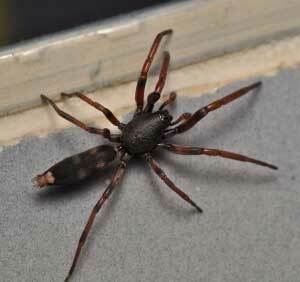 So if your home has a lot of spiders around you will have white tailed spiders around too! White tail spiders to not use webs and so can often be found in linen cupboards and linen, in beds, in shoes, wood piles and in towels and clothing as it is brought inside. White Tails also bite and in some cases can cause irritation, sometimes quite severe leaving large sores etc. White Tailed spiders are easily treated in the same way as with regular spiders, sometimes extra areas are treated outside too. Ants are an increasing problem in New Zealand due to our climate and environment. Ants get into walls and ceilings, into floor spaces and beams, under cobbles, bricks and paving stones, into pot plants and gardens walls etc. Once into these sorts of places ants can cause all kinds of damage, some major and some minor. Inside walls and ceilings ants can nest in power sockets, light switches and light fittings creating a fire hazard. Underneath bricks, cobbles and driveways ants push out the sand and soil creating cracks etc as the surface sinks and moves. Along with damage ants can be a real nuisance in kitchen and living areas, making food preparation a pain as they come in vast numbers trying to gather food for their nests. There are several different main types of ants in New Zealand; treatments are basically the same for each type. Ants are very resilient and in many cases a pyrethrum spray inside and outside the home solves the pest problem. Inside select home services will treat wall and ceiling surfaces with a natural pyrethrum and then outside in affected areas, around doors and windows and a ground level perimeter spray with a natural pyrethrum also. In some cases this won’t work and it is better to use a gel baiting and pyrethrum dusting program. Where nesting areas are dusted and ant trails have gel baits placed along them. The gel baits are taken back into the nest and consumed which kills the ants and over time will eradicate the ants nest. The best thing to do if you find ant trails around your home is to call Select Home Services Ltd, ant problems are rarely solved by supermarket and hardware store products. Mosquito’s are a nuisance year round in New Zealand due to our damp and humid climate. Mosquito’s are most commonly found in dark, damp, shady areas with still water nearby. Many homes in New Zealand fit these exact criteria and evening summer barbeques can leave you with mosquito bites everywhere. Select Home Services can treat your home for mosquito’s by spraying throughout the inside of your home with a pyrethrum and also on exterior wall surfaces, decking, around windows and any other outside area our technicians believe to be a mosquito area. Select Home Services can also provide you with pyrethrum dispenser machines that release a small amount of spray to help repel mosquitoes. This coupled with a full house treatment is very successful at ridding your home from mosquitoes and other flying insects. There are also different luminous mosquito lights which are great to hang outside nearby seating areas and decks to attract and kill mosquitoes outside.